Does your business know how to harness the power of social media ? You are losing business, does your competitor have one? Our social networking statistics show that Facebook penetration in Gibraltar is 66.84% compared to the country’s population and 95.54% in relation to number of Internet users. The total number of FB users in Gibraltar is reaching 19300 and grew by more than 500 in the last 6 months. 65% of Facebook users are 25 and older. 40% of Facebook users are over 35. The fastest growing demographic continues to be 55+. Your customers are already there, facebook is the de-facto social media platform with over 800 million users worldwide so you can be sure that your current and future customers will be on facebook. Gibraltar Facebook demographics is other social media statistics we monitor. The largest age group is currently 25-34, followed by the users in the age of35-44. There are 51% male users and 49% female users in Gibraltar, compared to 47% and 53% in Dominicaand 42% and 58% in Tonga . Do you even know how to interact with them? Your competitors are probably already ahead of you as many local businesses have already created their own custom facebook fanpage and are engaging their old and new customers daily. Along with this “pay-to-play” announcement, Facebook has made a point to say the content they are going to show the most in the News Feed is original, high quality content that adds value to your fans.So, before posting something to your page, ask yourself, would I find this valuable? Would I share this post? Does it entertain people? If the answer’s yes, go for it. If it’s no, think about how you can make it better. Facebook ads. If you’re serious at all about marketing your business on Facebook (and you should be), ads need to be part of your strategy. I know you probably don’t want to hear that, but it’s true. With all these recent changes, that seem to be here to stay, there’s never been a more important time to understand Facebook ads.The fun part about it, though, is you don’t need to spend a lot of money on Facebook ads to see success. When done right, they can be ridiculously effective in selling your products and/or services. It’s always been this way — the most successful businesses on Facebook use a mix of organic posting and strategic paid ads. A version of this article first appeared at RickMulready.com. Did you know Facebook is the second most visited website in the world, behind only Google? According to Alexa.com, 3% of all Internet traffic visits Facebook each day. If you’re not promoting your business on Facebook, you’re missing out on a huge amount of potential traffic to your business. Facebook is an ideal platform for interacting with your customers. So how does this work? Creating a Business Account Facebook gives you the ability to create a “fan page” for your business. By creating your business fan page, you give your customers the ability to interact with you directly and with other fans of your business. The fan page gives you the ability to know your customers better and to build trust with them. You have the ability to create events, invite groups, ask interesting questions, offer coupons and run fan contests among other things. Getting People to “Like” You After creating your fan page, you want to make sure customers can find your page and “like” it. Start by making your friends and family know about your new fan page so they can like it. Next, you want to make sure your existing customers are aware of your Facebook page. Promote your new page in your store or in your advertising. Once you get someone to like your page, that like will show up on their page. In addition, they will see any future updates you post on your fan page. This is your opportunity to promote upcoming sales or in-store events to your fans. This is a great way to get a start with your fan page, but if you want more visibility, there are other tactics you can take to get more likes on your page. When you get a visitor to your page who’s unfamiliar with your business, how do you get them to like you? Facebook gives you the ability to offer incentives for liking your page. For example, you could offer someone a discount coupon for liking your page. Keeping Visitors Engaged Facebook is all about interaction. You’ll need to make sure you post to your fan page regularly to keep people engaged with your business. Run a poll and ask your fans questions about your business. What services would they like to see offered that you don’t offer currently? What’s their favourite item from the menu? However, you need to be careful that you don’t spend all day posting Facebook updates about your business. This could quickly turn off your fans when you fill up their Facebook page with all of your updates. Facebook Advertising Facebook advertising has much more powerful capabilities than Google Adwords. With Facebook advertising, you can target potential visitors by age group, gender, marital status, education, country and other interests they have. By targeting your ads to the specific demographic that your business is interested in, you have the ability to get a higher return on your advertising investment. But it’s important that you track your advertising closely to make sure that you drop ads that are underperforming and promote These are all areas where an experience Facebook marketer can help to promote your business. Contact us today to see how we can help setup and manage your Facebook fan page. Facebook, which is fast-headed towards a record-breaking IPO, is betting a lot on Sponsored Stories. It’s clearly counting on the paid ads, which appear in the news feed and perhaps most importantly, be displayed to mobile Facebook users, making them the company’s first mobile ad unit ever. For advertisers eager to experiment with Sponsored Stories, Facebook has unveiled a beta version of a Demo Tool that allows advertisers to see what their Sponsored Stories will look like on the web and Facebook’s mobile app. Using the Demo Tool, one thing is immediately apparently: these ads are really prominent. As Simply Zesty observes, “The major feature that stands out is the amount of space that will be dedicated towards this new advertising format. Judging by the examples Facebook gives in its app and assuming that there will be other information placed beside it on the right-hand side like friends’ photos, a significant amount of space will be reserved for these adverts.” Mobile Sponsored Stories are slightly less intrusive, as they appear further down in the news feed, but their mere presence in the news feed represents a major change to the Facebook mobile experience which has been ad-free to this point. The big question for advertisers is whether or not Sponsored Stories will be effective. Time will tell, but if anything is certain, it’s this: Sponsored Stories are a risky proposition for advertisers. Introducing ads to one of the most personal parts of the Facebook experience (the news feed) will probably be a turn-off for many Facebook users, putting advertisers using Sponsored Stories in a precarious position. 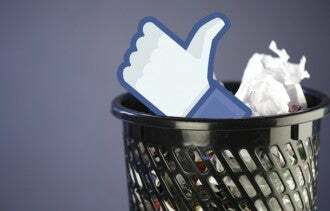 More importantly, advertisers will face the temptation to use Facebook’s Reach Generator to ensure that their ads invade even more users’ news feeds than their organic content already does. At this point, there’s not much users can do. Facebook is going to see a lot more advertising. At a very minimum, however, users can hope that advertisers will be somewhat conscientious and use the Demo Tool to make sure their Sponsored Stories don’t look too annoying.